Approximately 16 million people in the United States have diabetes and one-third of them do not know it. Diabetes is the leading cause of new blindness among adults and people with diabetes are 25 times more likely to become blind than people without it. By detecting and treating diabetic eye disease early through annual, dilated eye exams, people with diabetes can preserve their sight. What does Diabetes have to do with my eyes? Diabetes can harm your vision or even cause blindness. With diabetes, your body does not use sugar the right way. This can effect the blood vessels (arteries and veins) in your eyes and other parts of your body. 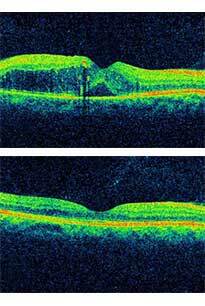 Diabetic retinopathy is the eye disease people with diabetes get most often. It is a major but preventable cause of blindness in adults in the U.S. The retina in the back of the eye sends pictures of what we see to the brain. 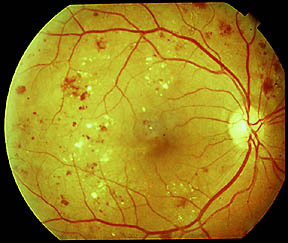 Diabetic retinopathy harms the blood vessels in the retina. This causes blurry vision. The longer you have diabetes the more likely you are to get diabetic retinopathy.